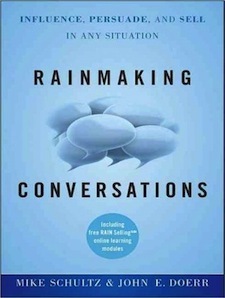 Tag Archives for " Rainmaking Conversations "
Conversations are a bit part of everything in business these days including selling. My guest for this week’s episode of the Duct Tape Marketing Podcast is Mike Schultz, president of the Rain Group, editor of RainToday and coauthor of Rainmaking Conversations: Influence, Persuade, and Sell in Any Situation. Schultz contends that the gap between what we are making and what we are worth, our incredible value, lies in having great sales conversations. Sales skills can be learned, desire and commitment are another thing. The salespeople that really want it and do what they need to – they get the end result. People buy from people they like. So, how do you get liked digitally? Buyers are yearning for a true deeper connection because companies let them down so often. Online interaction has the potential to facilitate relationships that are started in person. In addition to the content in the book, Schultz has compiled a number of resources, tools, and free online training to help you more quickly and effectively apply RAIN Selling to your sales efforts and take your selling to the next level.